Tiffany's Online Finds and Deals: Enter to win a 12 INCH Cast iron Skillet! 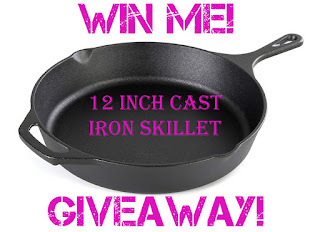 Enter to win a 12 INCH Cast iron Skillet! Cast iron skillets are amazing. They have a great variety of uses. I used to think people only cooked cornbread in cast iron skillets as that is all I ever seen my family cooking in them. Boy was I wrong! My favorite is to use my cast iron skillet to bake in or pan fry steaks. There are a ton of great cast iron cooking recipes that can be found online. Cast iron skillets are great for camping. You can use cast iron directly over the flames. Some think maintaining a cast iron skillet is hard work but its not! If kept seasoned well, cast iron is easy to care for! I recommend to oil after every wash or so. I also recommend a cast iron scrubber. They make cleaning a breeze and work great on stainless steel too. I'm excited to announce I'm giving away a free 12 INCH Cast iron Skillet to one lucky winner! I love cooking with cast iron and want to share one to one of my lucky fans! You can enter the giveaway below with the gleam widget. This is a FLASH giveaway and ends 9/ 22, Winner will be announced on my FB Fan page and Group. Winner will have 24 hours to claim their prize. Open to US residents only. Approx cast iron pan measurement:12" by 2.1" by 18". Win a cast iron skillet! Awesome giveaway! Thank you for the chance! I need this pan in my life. The other pans I own are too small and I would love to be able to do some skillet dishes that go in the oven big enough to feed my whole family. I absolutely LOVE cast iron cookware! This would be amazing to win! Cast iron skillets are the best to cook with! I can always use one more! Good luck everyone. Awesome giveaway. Love that you do this! Awesome give away! I've always wanted a cast iron skillet. I'd love to try my favorite pork chop recipe in it. CAST IRON IS SO EASY TO WORK WITH, AND TO STORE. Love cast iron! I almost never use anything else to cook with. Awesome giveaway! I would love to have this! There is nothing more versatile than cast iron. It can be used in the oven, on the stove top and even over a campfire or grill. With care it will last a lifetime and beyond! This cast iron skillet would be perfect. Just moved into my own house and would love one! will be perfect for sausage gravy. thanks for the chance. I would use it to cook a nice strip steak. I love using it to sear off my meats. "Oh mama I have got to get me one of these!" I’d use it to make cornbread! I would cook homemade home fries with onions and peppers in the cast iron skillet.Home fries are my favorite. Cast Iron skillets are my favorite to cook in and take camping. Thanks for the chance to win one. I would love to use a cast iron skillet but I have heard you cannot use them on glass top stoves because they cuase the stovetop to crack or break...am not sure if this is true but even if it is I could still use this in my oven for casserole dishes or cornbread! Cast iron is the best. They work great for camping too! Cast iron cakes are awesome- especially pineapple upside-down cake. I would have to make that ASAP. My favorite way to fry chicken and bake cornbread! This would be awesome to win!! My name came up as unknown. Not sure why. Would love to win!! This is great! Thanks for the chance! Thank you for the awesome giveaways! This would be amazing to win! Love your page, you have saved me a fortune on amazing items! I would cook a nice juicy steak in it if I won!! OMGoodness! I can always use another cast iron skillet, I love to cook my meals in them better then the stylish cookware! I am in dire need of a new one. Fingers crossed! I will cook corn bread in it. I would love to win and cook up some delicious pork roll! I would make bacon, eggs and veggies! This would be a great Christmas present for someone I know. Thanks for the chance to win. This would be my first cast iron skillet!! I would love to win this!! I love making pineapple upside down cake in it. I would love to have this cast iron skillet to add to my gluten free pans (we have to have 2 sets of pots & pans, etc. in our house). I am in love with cooking with cast iron! I would love to win this for my new house!!! Love cast iron skillets they are the best. I would cook a ribeye.